Christopher Gladwell is a leading senior yoga teacher trainer from the UK. He has been actively studying yoga in its various forms of physical practice (asana), bodywork, breathwork and pranayama, meditation and mindfulness, vibration and mantra, devotion and bhakti for about 35 years. He is the author of "Engaged Yoga" and runs a busy studio in Bristol, in between running workshops and trainings across Europe. Engaged Yoga is the modern art and science of yoga for urban yogis. If you are looking for a direct experience of a deeper awareness of who you are and how the energy of life can move through you with more fluidity and vitality, then these are the workshops for you. neuroscience, myo-fascial meridians, evolutionary biology and scientific research. This facilitates a multi-dimensional practice, using the stages of development (kramas) and with the five prana vayus (samana, apana, prana, vyana, udana). We will work with each person’s individual body-mind to craft a practice that serves your needs. We will work with meditation based on the first two chapters of Patanjali's Yoga Sutras. The Sutric path of yoga is disciplining the mind. This mind training leads you to freedom by using the mind to transcend the mind. In Tantra yoga, the roots of practice are grounded in the earth of our physical body, so our day begins with the practice of biomechanically intelligent asana that honours the innate wisdom of the body. The asana is taught in a step by step manner and rooted in neuroscience, myo-fascial meridians, evolutionary biology and scientific research. This facilitates a multi-dimensional practice, using the stages of development (kramas) and with the five prana vayus (samana, apana, prana, vyana, udana). We will work with each person’s individual body-mind to craft a practice that serves your needs. Including energy based meditations from the tantras and an exploration of classical and modern tantra. These teachings enable you to understand the totality of your life as the flow of divinity. 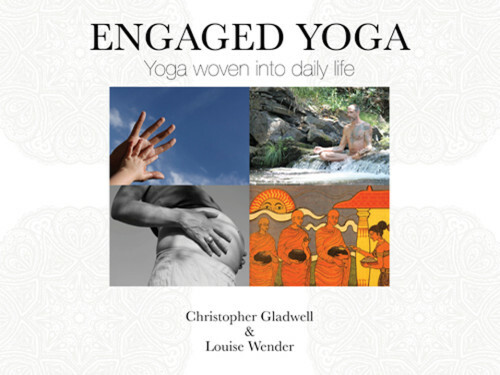 LIVING YOGA: Weaving awareness in everyday life through Engaged Yoga. To bring awareness into everyday life, we must begin with an understanding and respect for the physical body, the vehicle in which we live and love. So the day begins with biomechanically intelligent asana, taught in a step by step manner and rooted in neuroscience, myo-fascial meridians, evolutionary biology and scientific research. This facilitates a multi-dimensional practice, using the stages of development (kramas) and with the five prana vayus (samana, apana, prana, vyana, udana). We will work with each person’s individual body-mind to craft a practice that serves your needs. Conscious co-evolution. Conscious co-evolution teaches us to understand life actually evolves and grows. It is also the means by which we can unite our minds, beliefs, hearts, energies and bodies into a potent force to save this beautiful blue jewel of a planet. Conscious co-evolution prioritises people, planet, our planetary co-inhabitants and our collective future over profit. What is your choice? This session helps you to make choices for change and connection in your life. It empowers you to put yoga into action, because it’s time for change, time to take individual and collective responsibility and make the necessary changes happen. It’s time for us to act together in line with conscious co-evolution.